Around this time each winter I start to look in the frozen food case for something different, something I’ve somehow overlooked in the past, something that would bring a sense of newness to my night’s dinner…you know what I mean…not the same old thing. And while lima beans don’t probably rank very high as far as glamor veggies go I have to say I was pleasantly surprised. Where lima beans do rank high however is on the easy to make scale. 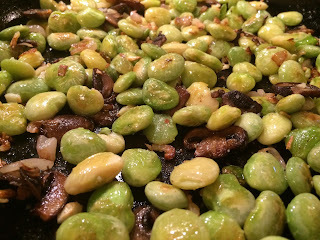 Heat a large pan, add some extra virgin olive oil, then the lima beans. If they’re right out of the freezer start on low heat until they soften then inch it up to medium high to get them lightly browned and crispy. Before serving lower the heat and add some chopped garlic and salt and pepper to taste. I also made them on three other occasions with mushrooms, shallots, and red chili flakes which were all very tasty. Lima beans aren’t just for soups anymore, at least in our house.